Boston Bruins forward Brad Marchand has emerged as one of the NHL’s elite goal scorers over the past two seasons. However, just because he’s putting the puck in the net more often, that doesn’t mean he’s not still a dirty little sh*t.
Earlier this season Marchand was suspended for slew-footing Red Wings defenseman Niklas Kronwall. Then, just one week later, he did it again to Lightning defenseman Anton Stralman. On Tuesday, just to prove he doesn’t have anything against Swedish defenseman, Marchand took things to the next level. 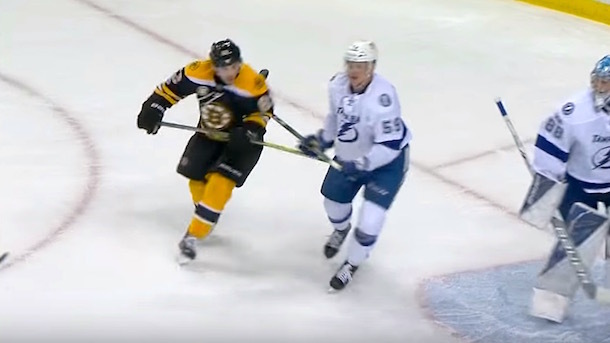 During a crucial game at home against the Lightning, with his team fighting for a wild card spot, the Bruins’ top scorer got himself ejected by spearing Tampa defenseman Jake Dotchin in the groin. The incident came with less than a minute remaining in a scoreless first period. Dotchin gave Marchand a very light cross check in front of the Lightning goal, and Marchard turned around and whacked the guy in the nuts with his stick. The referee immediately raised his arm to signal a penalty as Dotchin crumpled to the ice in pain. Fortunately for Marchand, the Bruins went on to win 4-0 without him, clinching their first playoff berth since 2014. Unfortunately for Marchand, that likely means the NHL will suspend him for the final two games of the regular season, seeing as how he is a repeat offender.